Using a pair of scissors, cut the shell of the prawns up the center of the back opposite from the legs to about half an inch from the tail. Then using a sharp knife, butterfly the prawns in their shell, cutting deeply without cutting through. Remove any black veins, but leave the shell and head on. Rinse and drain. Let sit at room temperature for at least 20 minutes before cooking. Break one of the heads of garlic into individual cloves. Cut the root tip off each clove, leaving the skin on. Do likewise with 3 of the shallots. Place them together on a tray and roast in a hot oven (450°) until softened – about 10 minutes for garlic, 15-20 minutes for shallots. (Cutting the tip keeps the garlic and shallots from popping and splattering the oven.) Chop the other head of garlic and 3 shallots and set aside. Trim off and discard the woody bottom tip of the lemon grass stalks. Remove one or two layers of the more fibrous outer leaves. Cut the remaining inner stalk into thin rounds, then chop coarsely. Set aside in a covered bowl to prevent drying out. Place the dried chillies in a dry pan with a pinch of salt and roast over medium heat until they are dark red and slightly charred, stirring frequently. Let cool before grinding in a spice grinder to a fine powder. When the roasted garlic and shallots are ready, peel off their skin and mash them in a mortar and pestle together with the powdered chillies to form a well-blended paste. Set aside. Prepare the remaining ingredients as instructed. Heat a wok over high heat until it is smoking hot. Swirl in 3 Tbs. 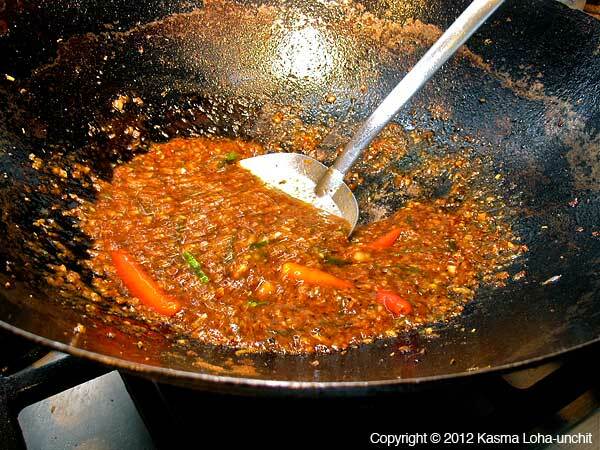 of oil to coat wok surface and wait 15-20 seconds for it to heat. Toss in the prawns and sear them in the hot wok for 1-2 minutes. When most of the shells have turned pink, remove from wok. 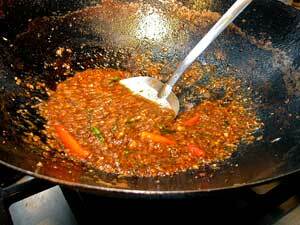 Add another 2-3 tablespoons of oil and heat 15-20 seconds. Sauté the chopped garlic and shallots in it for 15-20 seconds before adding the mashed roasted paste. Sauté a short while longer, then stir in the chopped lemon grass, slivered kaffir lime leaves and crushed whole Thai chillies. Stir-fry another half to one minute. When the mixture is well-blended and fragrant with the herbs, season to taste with fish sauce, palm sugar and lime juice. Reduce liquid so that the mixture is thick and almost dry. Toss the prawns back in and stir-fry with the lemon grass mixture for 1-2 minutes, or until they are just cooked through. Transfer to a serving platter and garnish top with cilantro. Serves 8 with rice and other dishes in a shared Thai-style meal. This recipe is a dry version of the well-known Hot-and-Sour Prawn Soup (Dtom Yum.) 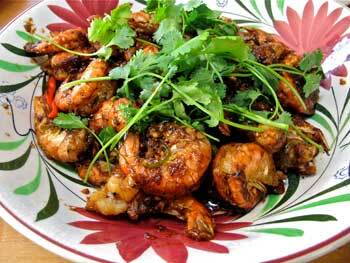 In fact, that's exactly what the Thai name means – dry dtom yum prawns (gkung = prawns, haeng = dry). 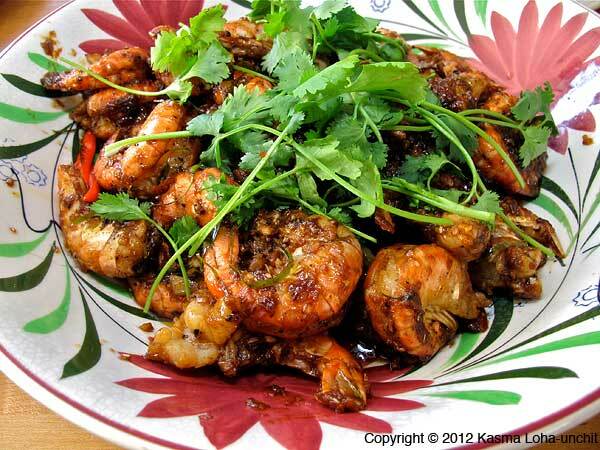 Every time I make these prawns, I am reminded of my first trip to the beautiful seacoast of Krabi many, many years ago. I remember being so impressed by so many things. The coastline was enchanting, decorated with dramatic limestone karsts, and the islands off-shore were idyllic, fringed with dazzling white-sand beaches and lively coral gardens. To make a paradise complete, the food was divine at the secluded resort with charming, island-style huts where I stayed. I will always remember the magical tiger prawns – so gorgeously fresh their eyes still twinkled as they lay on the ice beckoning me to pick them out for the chef to cook. He masterfully prepared and dressed the chosen ones in the most fitting clothes and delivered them to my table cloaked in an alluring veil of spicy fragrance. One bite and I thought I must be in heaven! The magnificent sunset coast in all its glory captured my heart and I have returned every year since. Much has changed and chefs have come and gone, but the food is still memorable. 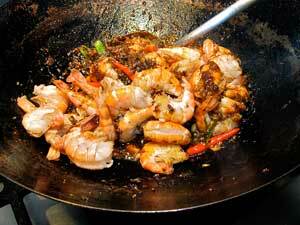 Without fail, the first meal on every visit would include the very special hot-and-sour prawns for old time's sake. *Because the Thai language has its own script, there are different ways of transliterating Thai into English. The more phonetic version is Gkoong Dtom Yum Haeng; the more usual spelling is Goong Tom Yum Haeng. See A Note on Thai Pronunciation and Spelling. See Also: Creating Harmonies with Primary Flavors.